Applying and interviewing for a new job can be tough – but it doesn’t have to be overwhelming. Follow these tips from Solomon and recruitment strategist Shannon Howell and land the job you’re after. Do include your entire work history. 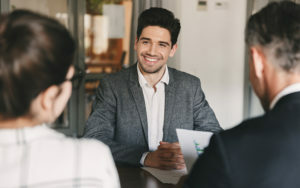 Listing all of your previous jobs and accomplishments will ensure you won’t be overlooked by the hiring manager and are being paid based on your years of experience. Don’t discredit your entry level job. Use the opportunity to showcase some of the less obvious skills you performed. Instead of listing flipping burgers on your resume, flaunt your customer service experience. “Use the skills you learned to highlight the skills needed in your next job,” Howell said. Do get that haircut. Show up to your interview clean, well-groomed and dressed professionally. “I’ve never had a manager say to me, ‘That person was too overdressed,’” Solomon said. Don’t wear jeans. Jeans and low cut tops are never appropriate for a job interview. Depending on the setting, neither are tattoos or vibrant hair colors. “We’re not looking at whether your clothes are expensive or in style. We just want to see that you put forth an effort and understand what it takes to present yourself professionally,” Howell said. Do be patient. The hiring process can take weeks or months. When you apply for a job through the OSF Careers website, you can check the status of your application. As long as it says you are still under consideration, be confident that you’re still in the running. Don’t be discouraged if you don’t get the job. There are many possible reasons that you didn’t get the position you were gunning for. If it’s a job or an organization you’re passionate about, keep looking for another opportunity. “Jobs are plentiful. We want to see how you accept feedback about what you could do better, so that when you re-apply in six months we can see that you’ve made progress,” Solomon said. Visit osfcareers.org to see what opportunities are available for you.